I know it’s Thanksgiving this week and this is not a Thanksgiving-related recipe in any way. BUT…we can’t just plan on eating turkey and stuffing and cranberry sauce all week, right? 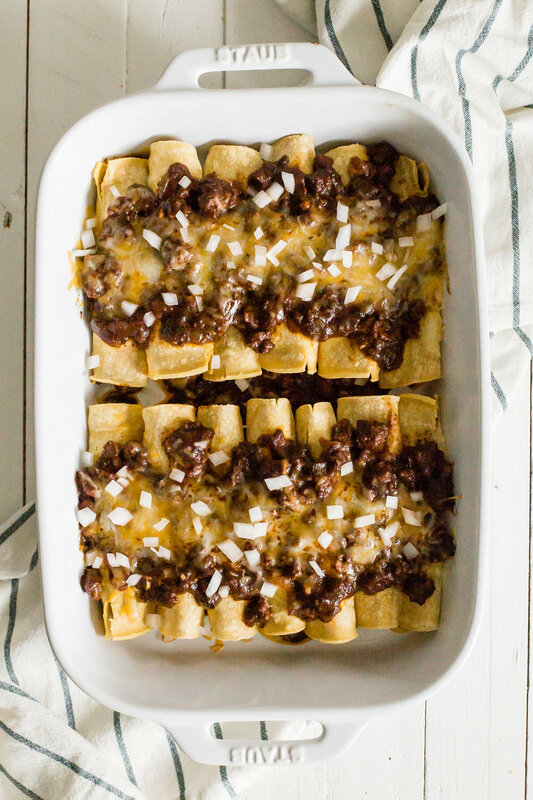 This dish is heavy, loaded with cheese and meat, and the type of casserole-like dinner that you might not be wanting to even think about after a big Thanksgiving meal. But sometimes, we need to indulge ourselves and after all, it is that time of year. I often want a major change of pace after Thanksgiving foods, and Tex-Mex or Chinese or even sushi tend to be things I gravitate towards after this week. Anyone else get where I’m at? If you are here for the recipe, continue scrolling down. Otherwise, I just wanted to say that I know I’ve been a little MIA from this space for essentially half the year. Y’ALL, I realllllyyyy miss it. The other day I realized there was a big part of me that felt like it was missing and I knew that it was my creative side that is obsessed with food, writing about food, reading recipes, cooking and experimenting in my kitchen. There has been a lot going on this year between going back to school again this summer, being pregnant and having strong food aversions (avocado and I are not friends! ), and juggling freelance projects on the side. It’s not an excuse, but it’s an explanation as to where I’ve been. Thank you for your patience and for sticking around. I love any and all comments or messages I’ve received throughout the interwebs asking about pregnancy or just checking in. I’m so thankful that I have this space and the opportunity to blog and occasionally make a living from it. If you made it this far, know that I am grateful for you even though we may have never met. This time of year is the best for a lot of reasons, but I mostly love how it forces you to reflect and count all the blessings in your life. I am thankful for many things, but one of them is this corner of the internet where I blab on about food and other random things. Heat a large pan (I prefer cast iron) over medium high heat. Add the ground beef, and cook until browned and completely cooked through. Season with plenty of salt and pepper. Remove from the pan with a slotted spoon, leaving drippings behind, and set aside on a plate. Add the onion to the pan and cook until soft, 7 - 10 minutes. Add the garlic and cook another minute more or until fragrant. Toss vegetables with the chile powder and cumin and cook for another minute or until fragrant. Add the ground beef back into the pan and stir in the flour. Toss to coat completely. Pour in 1/2 cup of the beef broth, and stir constantly until mixture has thickened. Add in the rest of the beef broth slowly, 1/2 cup at a time, stirring after each addition. Lower heat until mixture is just simmering. Simmer for 30 - 45 minutes, stirring occasionally and adding more water or broth if needed. Preheat oven to 425°F. 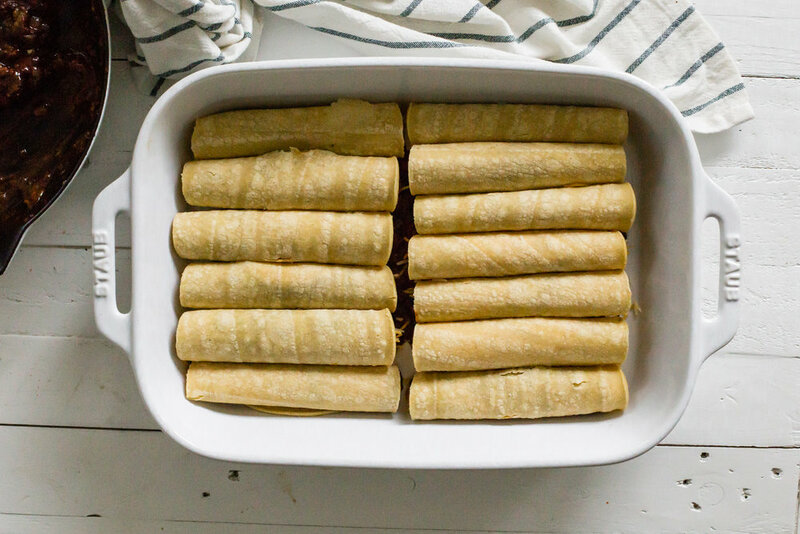 Place 12 tortillas on a microwave safe plate and heat until warmed through, about 30 seconds. In a 9x13” baking dish, spread about 1/2 cup of the chili mixture into the bottom of the pan. 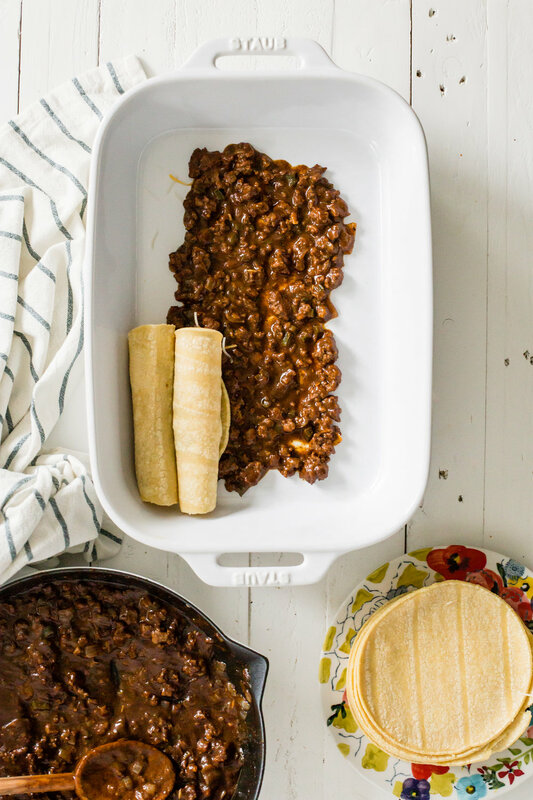 Fill a tortilla with a large spoonful of chili and double the amount of cheese. (Think one part meat mixture, two parts cheese). Roll up tortilla around filling, and place seam side down in baking dish. Repeat with remaining tortillas/filling. Spoon remaining chili on top of enchiladas and sprinkle with cheese. Bake in preheated oven until cheese is melted and everything is heated through, about 15 minutes. Garnish with onion and cilantro. Serve! Whenever I visit a new city, my first priority is to find out where the best coffee shop is. I love coffee, I love mornings, and I love coffee shops. Austin has a great variety of coffeeshops all over the city, and I am here showing you some of my favorites! Apanas Coffee and Beer - This is a great coffee shop to get work done and enjoy a breakfast taco or fresh juice. I love how spacious it is and it is usually filled with other folks who work from home which makes the vibe perfect for me during the work week. Plus, after the work day ends they start serving beer! Elizabeth Street Cafe - While not typically considered a coffee shop because they are known for their pho and banh mi, I love this place because they have breakfast pastries (including beignets!) and a wide array of coffee drinks made with Stumptown Coffee. The airiness and bright interior and friendly waitstaff make it a cozy place to enjoy your morning coffee. Summer Moon - The coffee is so good here. They serve coffee made from wood-fired beans and have their own signature moon milk! I usually order the half moon latte because I don't like my coffee too sweet, but if you really want a treat order the Wintermoon or Iced Mocha Moon. They also have delicious pastries (some GF) and even serve Tacodeli breakfast tacos until they run out! The Factory Cafe - There are so many great things about this place from the interior to the food to the coffee. I especially love their matcha latte and fried chicken and waffle sandwich. The interior has a lot of natural light and there are a lot of seating options--including indoor swing seats! Just a heads up there is no wifi here and do not bring your laptop; they are not allowed and will tell you so! Brentwood Social House - I just recently discovered this spot but am so in love with everything about it! It's an old house renovated into a coffee shop and is large and spacious with plenty of seating. One of the owners is originally from England and makes authentic scones. It's very charming and even has outdoor seating. Fried margaritas, chicken fried bacon, fried guacamole, deep fried clam "chowda", doritos bacon mozzarella cheese stick, the list of fried foods at the state fair could go on and on. I feel like it's become some sort of understood rule at the state fair to simply fry EVERYTHING and serve it on a stick or on a paper plate and charge 12 tickets for it. Bacon? It's already kind of fried but let's deep-fry it in chicken breading. Spaghetti and meatballs? Let's deep-fry that too! What about butter? Sure!!! Basically, anything goes. While I wish I could say that I tried most of these delicacies, the combination of riding fair rides and eating weird fried foods isn't the smartest idea. What we did try were the fried oreos, fried cookie dough, kool-aid pickles, turkey leg, Texas cider, and obviously, the original state fair corn dog with mustard. I also snuck in a vegetable plate that cost me 20 tickets because I felt like if I didn't eat something green and leafy I would die. No one complained, because we all felt the same way. Other things I wanted to try that you should eat when you go include: fried smores, fried pickles, fried guacamole, fried avocado bites, and the frito pie. The state fair brings back so many memories because my family and I used to come here almost every year when I was growing up in Dallas. My dad and mom (who sadly couldn't come with us this weekend) would pull my brother and me in a little green wagon, and allow us to actually have a soda for the day! It was the best. We would ride the ferris wheel, stumble through the house of mirrors, visit all of the livestock (aren't those llamas cute? ), and check out the car show. This past weekend was my first time going since I was probably around seven, and it was Kyle's first time so it made it really special. On the way there we also stopped in West where we bought a boxful of kolaches from the Little Czech Bakery! This was probably one of the reasons why no one could stomach much more unhealthy foods at the fair.